The National Mustang Owner's Museum is dedicated to all things Mustang, but especially the people who love them. The display called a Preview Museum is open in a temporary location, in Concord, North Carolina. 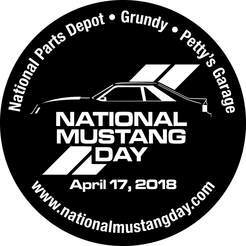 It has big plans for National Mustang Day on April 18, 2018. The National Mustang Owner’s Museum is open at its temporary location just in time for National Mustang Day. Ford debuted the first 1964 ½ Mustang on April 17th, 1964 and every year Mustang owners celebrate the anniversary of the iconic pony car. With the 2019 Ford Bullitt Mustang already available for orders, the performance car is racing into history, as one of the longest continually-produced nameplates. The Mustang Owner’s Mustang has opened, in what it is calling a preview location, on Carpenter Ct. NW, in Concord, North Carolina. Two hundred Mustang enthusiasts were on hand Easter week-end, as the preview location opened to the public for the first time. The Preview Museum has several Mustangs on display. It features memorabilia exhibits and has an area dedicated to the Founder’s Club. The Preview Museum has a full week-end of activities planned for the 2018 Mustang Day celebration. Most of the annual celebration’s activities center on the Preview Museum, which will be open. However, on Friday, April 13th, 2018, attendees are invited to an Open Track event at the Charlotte Motor Speedway. Registered drivers will be allowed to take their Mustangs out on the track. For owners who are not interested in revving it up on the track, later in the day, they are also hosting Parade Laps for drivers who just want to experience the feeling of being on a speedway. Friday evening, the museum is sponsoring a social event with members going to a brewery and food truck get-together. On Saturday, pony car enthusiasts will be treated to seminars featuring Lyle Sturgis from Roush, Lee Holman from Holman Moody, Art Hyde, a retired Ford Engineer and Mustang Designer. The speakers will also serve as the judges for the Mustang Car show and contest. The keynote speaker for the Saturday night banquet will be Gale Halderman, the designer of the 1964 Mustang. Mustangs from a well-known private collection will also be on display in a nearby museum. On Sunday, the fans who are registered will be treated to the Petty Museum, about an hour away, where the festivities will continue. In June, the Mustang Owner’s Museum will host another special week-end of festivities. The members will be celebrating the 50th Anniversary of the 1968 Mustang! This includes the Bullitt, Cobra Jet and California Special. The Museum which is currently under construction wants to be a permanent structure honoring the vehicle that touched off the pony wars back in the mid 60’s. The Ford Mustang is one of the most beloved vehicles in history. The 2019 Bullitt Mustang was just announced at the North American International Auto Show, in Detroit, in January.